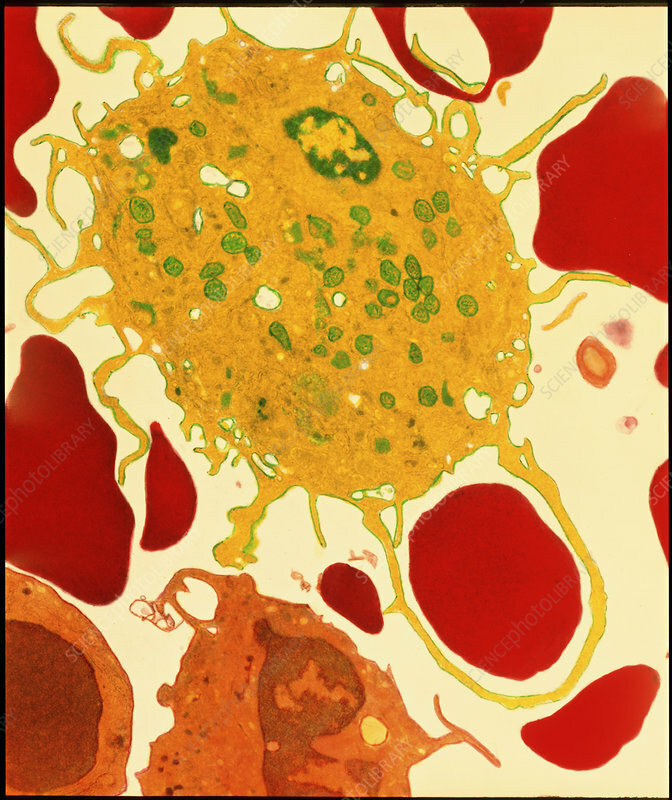 Macrophage eating red blood cell.b Coloured transmission electron micrograph (TEM) of a section through a macrophage engulfing a red blood cell. At top is the macrophage (green), a type of white blood cell which scavenges and plays a role in the immune response. Here it has a granular cytoplasm and pseudopodia "arms"; at lower right one of the "arms" has engulfed a red blood cell by a process known as phagocytosis. Red blood cells are unable to repair themselves, living on average 120 days, to then be consumed by macrophages. What signals the macrophage to engulf it is unknown. New red blood cells are constantly manufactured in the body. Magnification: x4,600 at 6x7cm size. Magnification; x15,000 at 8x10 inch size.